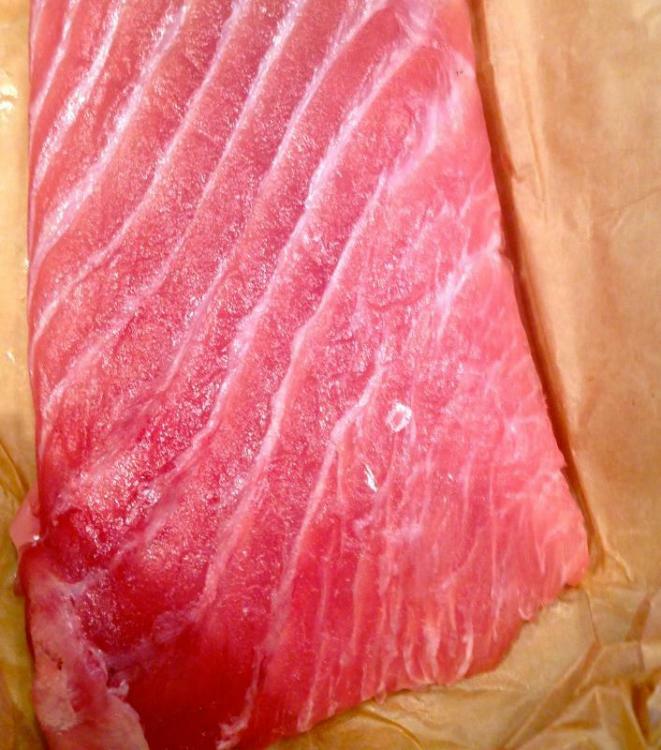 Tuna belly at Whole Foods at a bargain 12.99 a pound. BRFM: Savoy cabbage, fennel bulb, baby "orange" carrots (new crop), small broccoli florets, teeny heads of white cauliflower (~3" diameter), old Poona Kheera cucumbers, bicolor corn, standard tomatoes, small long Japanese eggplants. 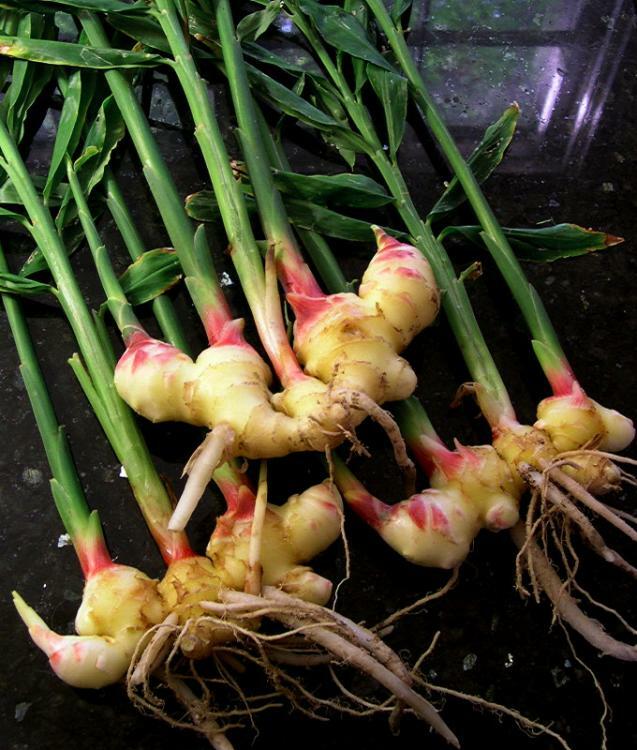 CFM: Straight-from-the-ground young ginger (finally!! ), green zucchini. Asia Mart: Yellow-skin chicken, Jinhua ham (金華火腿), shrimp & pork wontons w/ XO sauce [Prime Food], abalone-chicken noodles [sau Tao], kkakdugi (cubed daikon kimchi), soft tofu, scallions, fresh skinny wonton noodles, kai-lan, corn oil. 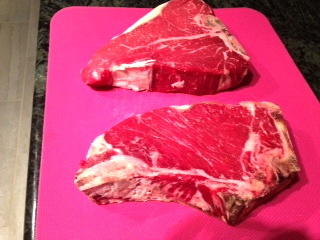 Dry aged porterhouse steak from Harris Teeter. BRFM: Maitake mushroom (half of a large frond), red carrots, young daikon, loose baby spinach, bundled spinach leaves, small broccoli florets, tomatoes. Goose the Market: Merguez sausages, Dodge City salami, Taleggio (Ciresa) cheese, Shagbark Oatmeal cookie (from H2O Sushi). The Fresh Market: Wild American (Georgia) shrimp, large croissants. 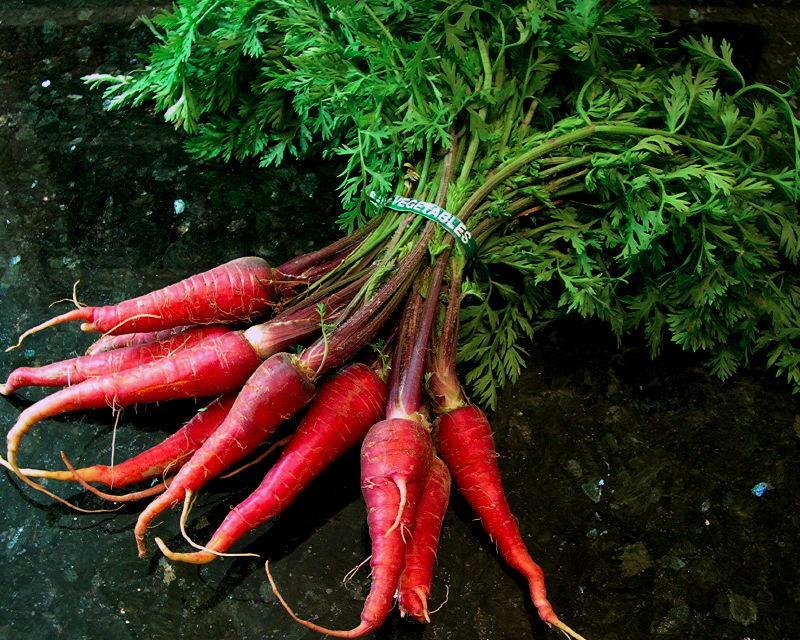 Huiray, those red carrots are just lovely...do they fade in color when cooked? I'd imagine them to be on the sweeter side when raw? Basmati rice (Zebra), basmati rice (Tilda), cinnamon sticks (Indonesian), dried kokum (lowanala), yellow mustard seeds, black mustard seeds, fenugreek seeds, jaggery powder, small mottled-color round squash, white turmeric - fresh, curry leaves (karuveppillai), roasted vermicelli (dry goods, package), Punjabi-style potato samosas (frozen) [Mezban]. Shan Wai Shan High Mountain Oolong tea, beef short ribs, head-on shrimp, Top Neck clams, green onions (scallions), cilantro, mini-cucumbers (Persian), Chinese long beans. Lion's Mane mushroom (1 head), celeriac, red turnips w/ greens, 3 sweet peppers, fennel bulb, large head of broccoli, green beans, Red Thumb fingerlings, tomatoes, large onions (2 red, 3 yellow), eggs. Pressed tongue, Westphalian ham, short-tied Knackwurst, coarse Braunschweiger. 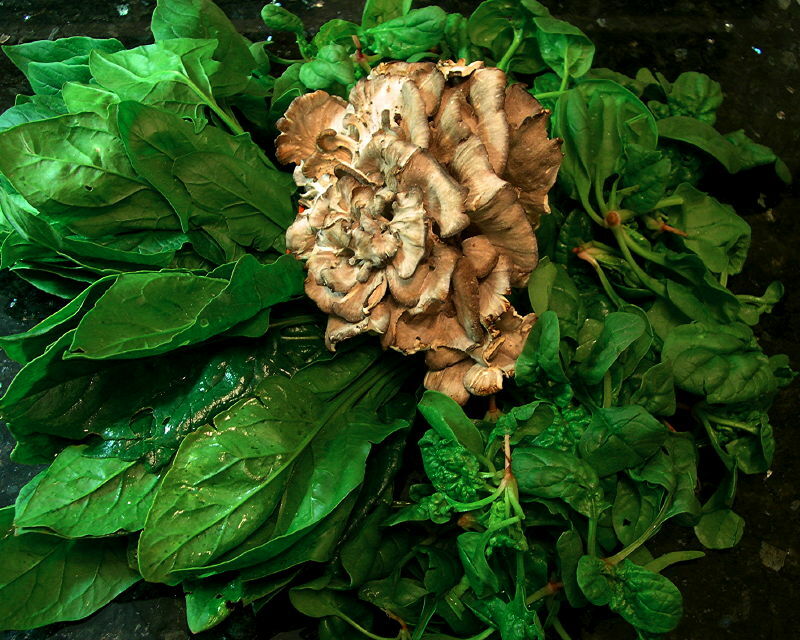 Broad Ripple Farmers' Market: Maitake mushrooms, broccoli rabe (they're beautiful! ), red carrots (stocking up), green beans, red-green hot chillies. Goose the Market: Tuna belly (at a fantastic price), duck livers (not foie gras), guanciale, a chunk of Parmigiano Reggiano. Time for a kick-up of the thread. Whole beef shanks/shins, sliced pork belly, frozen stewing chicken, duck wings, Kimlan aged soy sauce, Lee Kum Kee double fermented soy sauce, preserved plums in brine (bottled), Lingham’s Extra Hot Sauce, canned young baby corn, sweet & sour pickled green peppercorns, fried shallots, fresh lotus roots, Opo squash, bitter melons, lettuce stems (celtuce), Vietnamese coriander, long hot green chillies, mung bean sprouts, scallions (6 bunches), Persian cucumbers, garlic, Prime Food Shrimp & Pork Hong Kong style frozen wontons, Prime Food Shanghai style Chinese spinach & pork wontons, rice shrimp rolls, dried Chinese mushrooms (small “tea flower mushrooms” type), Paldo “Fried Kimchi Instant Noodles” pack. Indy Farmers' Market: Yellow/green-shouldered carrots, pastured eggs, lacinato kale, fennel bulbs. Goose the Market: A chunk of foie gras; a couple of duck leg quarters; chunks of Parmigiano Reggiano, Old Kentucky Tomme, Gilead [a new one from Kokoborrego] cheeses; crusty baguette. Cardoon stems, leafy celery, French breakfast radishes, baby kale, red & yellow & orange heirloom beets, tomatoes (stored from the last fall crop from a farmer I trust), Greek Cristopsomo bread. Medjool dates, house-produced hot Capicola, Finocchiona, Benton Kentucky Farmer's Ham, freshly ground beef chuck (I watched then cut up really nice looking slabs of chuck and feed them into the grinder). Linguine & penne [both Rustichella d'Abruzzo], lumachine [Garofalo]. Sunday, 1 Feb 2015. At the big farmers' market. The limes make me want to cry. 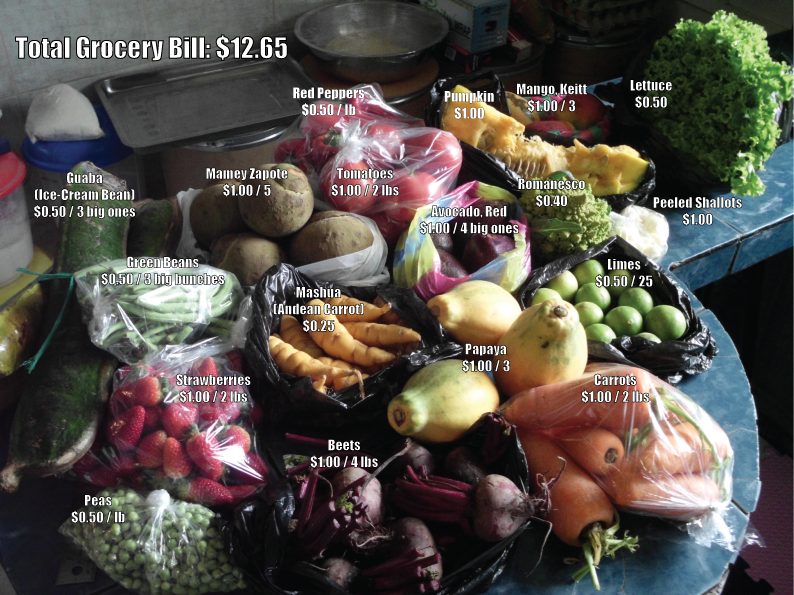 ALL of it makes me very jealous of your access to inexpensive, very good produce! I have also relished your posts about your local fish markets. If you think of it, the next time you go for your local fish, I'm quite sure I'm not the only one on the board who'd appreciate a post about it. For that matter, I also adore your sugar sculpture creations for cake decorations, etc. Dragons and sheep, oh my. I know you are busy, but please come back and share with us OFTEN. Panaderia Canadiense, thanks for adding to this thread. Your purchases look nice. 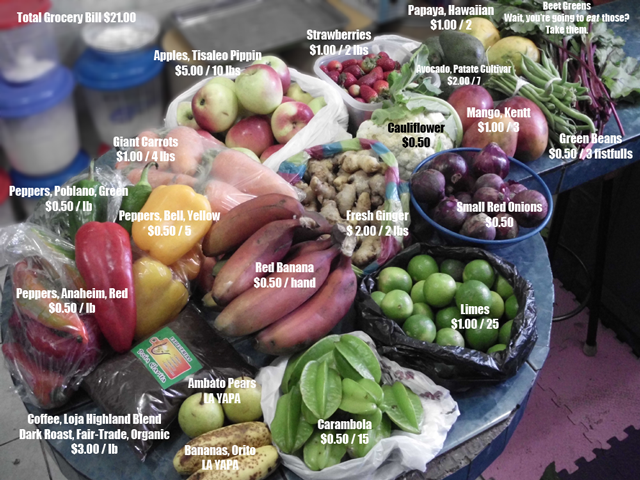 It is interesting to see the differences in the cost (and availability) between various ingredients in different parts of the world. I had a "shopping trip" at my local Asia Mart which turned into a major affair (don't it seem like one walks into a place intending to pick up just a few thing and a while later it is anything but...) which may or may not be interesting to folks here, given their (non)-responses to previous postings. 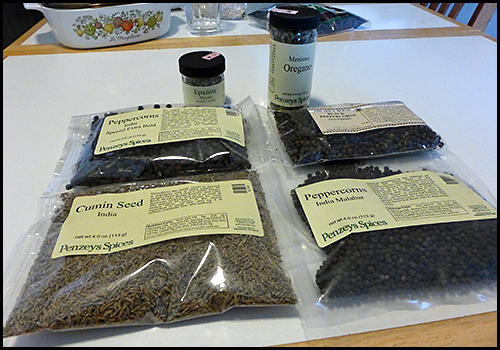 My latest purchases were spices from Penzeys: cumin seed, three types of black pepper, Mexican oregano, and epazote. Thanks, Crepes! They've recently reopened the front portion of my favourite fish market, which burned down around this time last year; I was planning to make a trip if not this weekend (which is Carnaval and therefore extremely busy for me) then next. I've been craving good fish, and frozen just doesn't cut it. I will of course post back here when I do, and also to the Eating the Fishery thread if I find something new - which is almost guaranteed, since the waters here are bountiful. Don't I know the phenomenon of going on for one or two things and coming out with 3 or 4 bags! :-D FWIW I too think it's interesting to see what people buy. Your purchases are interesting and, as always, beautifully photographed...I'm usually mostly amazed at the variety, given my lack of access to anything like an Asian market. A slightly bigger week at the market this time. Not pictured are the specialty flours (quinua, amaranth, 000 milled whole wheat), shredded coconut, yeast, and other bakery supplies. Wow, your limes doubled in price since last time. 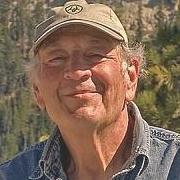 It's a weekly fluctuation depending on the harvest. Next week they might be 30 for 50 cents. Panaderia, whatever became of the replacement/rebuilding/whatever of that large market (with the large fresh fish sections) in your locale that burned down? Various things, Huiray - the front portion of the building had some of its roof supports replaced, was re-roofed, and has been reopened to the public. The back half of the market is being completely rebuilt. This means that my fishmongers will be a more frequent addition to this and the Fishery thread. Just, not during Lent. The price of fish almost triples for 40 days in my city, because it's customary to give up meat. Oh man, I miss cheap starfruit/carambola. Around here, when I see them, they're $3 for one! And they're usually overly ripened and getting brown around the edges. 50c for 15 would be a dream. I used to sit by the tv with a giant pile of starfruit as a kid and polish them off one by one.